In this complimentary 2-hour VETgirl online webinar, we review the recent outbreaks of dog flu (Canine Influenza Virus) affecting the Southern United States due to a recent outbreak that was thought to start at two dog shows. What originated as an outbreak in Chicago, IL has since affected over 30 states, with Florida, Georgia, Texas, Louisiana, North Carolina, South Carolina, Tennessee, and Kentucky being most recently affected. So, if you have a coughing, febrile, dyspneic dog presenting to your clinic, what do you do? In this lecture, we review the etiology of this dog flu outbreak, the story of how H3N2 was first discovered, current data, updates in diagnostic testing, information about general sanitation for veterinary clinics and shelters, prophylaxis, clinical signs, and overall treatment. We also discuss how to educate your pet owners on this outbreak and what preventative measures you can do to prevent the disease spread. This webinar was powered by Merck Animal Health, makers of Nobivac Canine Flu Bivalent. Hello, I received a link to this webinar from our Merck rep but both my husband and I are veterinarians and we need another link to be able to watch and both get CE credit. Is there anyway I can get another link through you all or do I need to go to our Merck rep? Sorry for late notice did not realize that it was single use only. I am putting his name and email address in the form so if you can send a link you can use that email address. Thanks so much. You can use the same link and register both of you guys with this link. Where do I go to get into the webinar? My internet cut out last night due to a thunderstorm – it was just before the prevention slides – may I have a copy of those? Or be able to review the presentation please? I was wondering specifically about what vaccines were discussed and if when an outbreak occurs, what disinfection protocols are taken. No worries – email us directly and we’ll send you a link to view the recording! Hope that helps! I did not watch webinar last night..i would like to watch tonight. How do i do that? 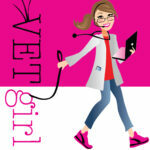 While VETgirl recordings are typically available for our VETgirl members only, you can view the recording here for you to view at your convenience. This will be available FREE for 30 days. If I am not a vetgirl member but logged into the free influenza webinar, how do we receive CE credit? Will it come via email?? Yup, we announced at the start and end of the webinar that you’ll get it 48 hours after the end of the webinar! 🙂 Stay tuned! I attended this webinar on 6/25/17 Canine Influenza and never received an email with my ce credit certificate. How do I fid or get it? Please check your spam folder and if it’s not there, please email us directly via contact page – thanks!